It's a feeling every adventurer knows and loves—the heart-racing excitement of discovering a chest stocked full of untold riches. With the forthcoming version update, players can look forward to experiencing this thrill anew with the introduction of the "Treasure Casket," a new type of treasure chest that will hold wonders for those fortunate enough to chance upon one! 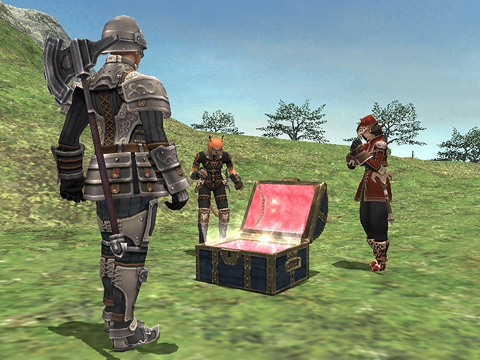 Treasure Caskets will present themselves on rare occasions only in certain areas which are part of the original FINAL FANTASY XI package. They will not appear in any expansion areas. Depending on their fortunes, adventurers may encounter either unlocked Treasure Caskets or locked ones. Unlocked caskets will open readily, allowing treasure hunters to immediately get their hands on the desired loot. Locked caskets will present a more formidable challenge, in the form of a numerical combination lock that you and your party members will have to rack your brains to solve. So sharpen those wits and have your puzzle-solving skills at the ready! What treasures will they hold? Unlocked caskets will contain an assortment of temporary items to assist you in your battles. Locked caskets will house a variety of equipment and items, and for the most fortunate adventurers, even exclusive equipment not to be found elsewhere! What riches lie in wait for you? You'll just have to track down one of these Treasure Caskets and see for yourself. Happy treasure-hunting!